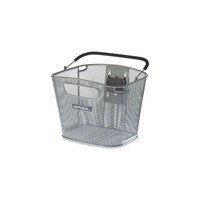 The Basil Basimply EC bicycle basket is a silver bike basket that’s both practical and stylish. A versatile choice that can be fitted to men and women’s bikes alike. The Basil Basimply EC bicycle basket is a compact oval bike basket suitable for fixture to all types of bikes. 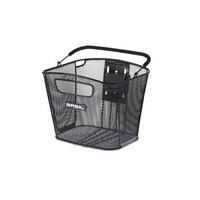 This basket is made from a durable fine-mesh steel that makes it a hard-wearing choice, ensuring it withstands everyday wear and tear while you’re out on the road. Whatever bike you have, this basket will provide an indispensable new addition to your frame. Whether you’re shopping at the store or visiting friends, you’ve a generous storage solution that can be used to cart essentials from A to B and back again with ease. This basket is also instantly removable, letting you load up on whatever before reattaching back to your bike frame, saving you the hassle of having to carry additional shopping bags and backpacks. A plastic handle makes removing it a breeze, while saving you the worry of injuring yourself on the steel mesh components. This compact bicycle basket is suitable for use with the Basil BasEasy Stemholder, the Basil BasEasy Luxurious Stemholder and the BasEasy Handlebar holder. It’s also suitable for use with a KF adaptor plate. Please note, you’ll need to purchase one of these separately from the basket if you don’t own one already. 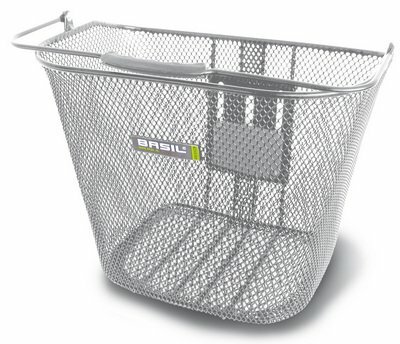 In addition to its versatile forms of attachment, this basket is height adjustable, with incremental slots allowing you to pick a configuration that’s right for you. A modern choice of basket with plenty of practical features, this bike basket boasts a superior build quality that will ensure it looks its best and performs well for years to come. Make the right choice and upgrade your bike with the Basil Basimply EC today. Looking for an alternative? Browse the complete range of baskets and bags on offer at Basil today, with plenty of interesting collections to inspire you. Don’t forget to stock up on those essential BasEasy system holders if you don’t already own one. This basket is height adjustable thanks to incremental slots, allowing you to fit it with the desired height. This basket is easily carried around thanks to a plastic handle. 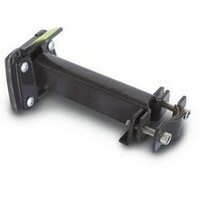 Easy to attach to your steering wheel thanks to the BasEasy system holder, sold separately.